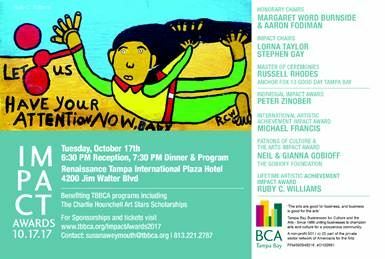 Tampa Bay Businesses for Culture & the Arts (“TBBCA”) Impact Awards. Michael Francis, Music Director of The Florida Orchestra, is the International Artistic Achievement Impact Award honoree; Peter Zinober, Esq., is the Individual Impact Award honoree; Ruby C. Williams, folk artist, is the Lifetime Artistic Achievement Impact Award honoree; Gobioff Foundation – Neil and Gianna Gobioff, are the Patrons of Culture & the Arts Impact Award honorees. Held yearly since TBBCA’s founding in 1989, Impact Awards celebrate and recognize those who have made outstanding contributions to and in support of arts and culture. TBBCA Impact Awards honors will be bestowed to Zinober, Francis, Williams, and the Gobioff Foundation on Tuesday, October 17, 2017, at the Renaissance Tampa International Plaza Hotel. The last two years’ Impact Awards sold out.